Imagine in an alternate universe that Elon Musk was a visionary, and wanted to change the world to use electric cars, how would he have gone about it? I can tell you, that reality looks nothing like the Tesla as it exists today. (These are a collection of ideas I had, from the first time that Elon claimed he wanted to change the industry (circa 2003), but it became obvious that he really didn't mean it). If you were a visionary and you wanted to disrupt the auto world, as Elon Musk claimed, then you'd think big. A lot bigger than he did with Tesla. This means more choices by customer, and more adoption by customers -- without as many problems in scalability (one non-car manufacturer, trying to learn how to make cars, one mistake at a time). Customers could upgrade parts (sections) one at a time. Have a kid, replace the convertible with a minivan or cross-over body. This is much greener, as right now the cost of batteries is so high, than when your battery pack dies, you throw away and scrap the car. This happens much quicker than IC (Internal Combustion cars). And scrapping and recycling takes more energy (CO2 and pollution) than an electric car saves. You could evolve to become car maker that doesn't make cars: where you just license your IP to everyone else. (Lotus was heading this way). It allows you to make platforms that everyone uses, and go instantly global, instead of being tied to a few manufacturing plants. You could create a storefront that isn't just what you make, but what everyone makes -- you pick a BMW suspension, an Audi body/shell, a Volvo interior, Tesla batteries and motor. Everyone wins: especially the consumer. And it would have really changed and reinvigorated the auto industry. But alas, Elon wasn't that much a visionary. Cars are pretty much a chassis (suspension and frame) and a motor and fuel (gas tank). Put those together, and they're called a "rolling chassis". You could drive it, with a fruit box as a seat -- but it wouldn't be very comfortable, entertaining, and you'd get bugs in your teeth. So on top of that, is bolted a body (shell). Totally different cars, like a Crossover SUV and a little hatchback, and a roadster, can all share a rolling chassis. There's a little nuance here, as some trucks use body-on-frame construction, as I'm talking about. But a lot more modern cars use "unibody", which is the body has a frame build into it, to save weight/cost, but that's not how the Tesla and some other electric cars are made, and it's not how cars were made at the start. So let's not get pedantic, and go with me on this: body-on-frame construction. Electric cars, aren't too different... though the motor is a lot smaller, and instead of 100 lbs of gasoline (in a 16 gallon tank), you get a 1200 lbs battery pack (in the case of the Tesla model S/X). GM created the Hi-wire design in 2002, that was basically what Elon/Tesla ripped off, 10 years later. An electric skateboard underneath with the battery and engine, and a bunch of bolt-on bodies on top. But this idea isn't new: electric remote control cars did this decades earlier. Once you design the chassis (the expensive part), you can have many models (bodies) slapped on top, assuming the wheelbase is the same size. The Model S sedan (a big 4 door), and the Model X (a minivan with more expensive and less reliable doors), that both sit on the same underpinnings. Now imagine this, when Tesla designed the Model S and X, instead of keeping everything proprietary (like they were ripping off Apple, or other car makers business model), they made everything modular, and documented all the major intersection points -- so others could make replacement parts (like they were ripping off the IBM PC Clones). There's always been a market in custom cars and "coach-builders" (more in the early days of cars), where someone can make a custom body. The problem is they have to design it to one model of car, and you have to buy a complete car, rip the body off, throw it away, and put the new body on. A lot of waste. 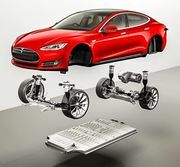 From the day the Tesla Model S design was shown, many kit car and custom car makers all begged Tesla to sell them just the skateboards and electronics. They'd put bodies around it, sometimes as a new model, sometimes as bespoke customizations for a single client. What this would have done, is that instead of Tesla only having one or two models from day one (a sedan), they could have had a whole line of cars: a pickup truck, and sports car, and convertible, an SUV, a minivan, a coupe. Customers could buy a customized car to fit their needs. A huge win for them. And there would have been many more cars sold. On top of that, since Elon's claimed goal was to create more electric cars -- he could have separated the battery design from the chassis. Allowed both to be replaced as well. Imagine someone wanted to make an off-road frame/suspension: as long as it fit Tesla's design specs, viola, you could make an offroader Tesla. Instead of just changing the dealer network to manufacture owned (ripping of the idea of Apple retail Stores), go web based. You could go to physical stores or roving pop-up stores and events to test-drive and try out. But you don't need physical stores at all. You could order on-line, with the options you wanted. So people act like Tesla having factory dealership is some big revolution, by ripping off Apple's company Store concept. But again, if they'd thought bigger, they would have had a bunch of different smaller presences -- with virtual service/repair networks. Imagine your car has a problem with the drive-train -- they could swap the skateboard, and you drive out in 20 minutes, with your body and everything inside, and they repair the skateboard without you being there. In airplanes these are [|LRU's: line-replaceable units]. In computers, there are a few companies (Qualcom, ARM, Apple, etc), that are called Fabless Foundries (or Chip makers). They design their own chips (or large parts of them), then just outsource the manufacturing to various places around the globe to manufacture them. Imagine that in car design? Where there are multiple battery manufacturers making battery packs that interface with a Tesla pack. Or they make bodies, suspensions, etc., to spec. You can distribute manufacturing all over the globe, much easier. And they all compete for best quality and price performance. Telsa didn't need to be an auto-maker, they could have been the auto-innovation platform. So I don't dislike Tesla, or Elon Musk. (I admire Elon's gumption). But both to me are a failure of vision, and a testament to not doing what they said they want to do: get everyone in electric cars. In a few ways, he did sort of push the industry forward... modestly and slowly. But if he'd done nothing, batteries would have continued to advance (costs would have come down, and range would have gone up), and someone else would have tried an electric car again. There's a strong argument that without him, hybrids would have expanded faster, and are still a better solution for many customers -- so you can argue that Tesla actually slowed down CO2 reduction. And it's certain that there's a lot more that could have been done, if they thought bigger. So again, goodonya to Elon for creating Tesla. Just don't feed me the line that this was hugely innovative, revolutionary, or it changed the way we make cars. He had that opportunity, and blew it. This page was last edited on 5 February 2019, at 04:33.